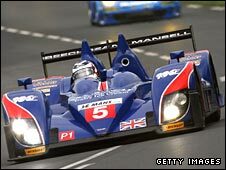 Britain's Nigel Mansell crashed only 17 minutes into his Le Mans 24 Hour race debut in France on Saturday. The ex-Formula 1 champion appeared to suffer a puncture before hitting the barriers after Mulsanne corner. Mansell, part of a three-driver line-up alongside sons Leo and Greg, remained in his car for several minutes before being taken to a waiting ambulance. Early reports from the track said he was helped out of his car by marshals but did not appear to be injured. An update on the Le Mans official website later claimed that Mansell was "fine" after receiving "a bump on the head". Mansell, who also won the 1993 IndyCar series in the United States, started from 18th on the grid in his Beechdean Motorsport Ginetta Zytek. After five laps, in slippery conditions, his car clipped the rail between posts 89 and 95 - a fast stretch known as Indianapolis. The world famous endurance race was held up for 31 minutes behind the safety car before getting underway again. Mansell arrived at the circuit's medical centre just after 1540 local time for assessment. He left in an ambulance bound for a local hospital 30 minutes later. Greg Mansell, 22, said: "He's having some extra checks. He took a bit of a knock but he should be fine." Speaking ahead of the race, Mansell Snr said: "The goal is to finish and get more competitive, and the biggest goal is to attract a sponsor so that we can continue our dream." It was the first time a team of drivers featuring a father and two sons has competed at Le Mans. Mansell retired from F1 after two races during the 1995 season but returned to the cockpit in the Grand Prix Masters Series for veteran F1 drivers in 2005 and 2006.